Eating raw fruits is not one of my favourite things, I prefer to eat fruits in a compote. I like the fact that it is all ready to eat and that the mix of fruits is nearly infinite; which leads to a good or bad surprise but it is always edible. 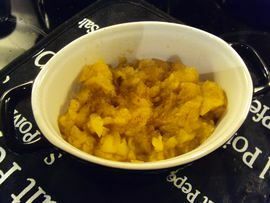 My last mix was apples with plum and some leftover of pineapple chunks (from the recipe: Roasted gammon with honey and mustard). 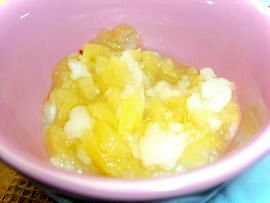 The taste is really delicious, the pineapple adds a little of a sour flavour to the whole compote but not too much. 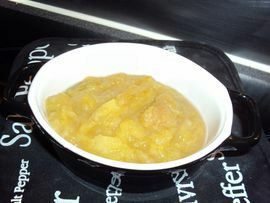 When I am doing compote, I like to eat some straight away when it is still warm then I prepare some yoghurt pot with the compote in it. I store them in the fridge for eating it as a dessert along with my lunch box or after dinner at home. 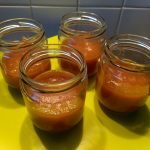 How to make apple, plum and pineapple compote? 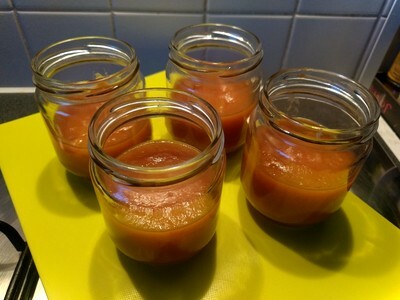 If you would like to have an extra smooth compote, I advise to try to peel as much as you can the plum or if you have not the time or the patience to do it, make sure that when you mix, you mix a little bit longer and stronger. Otherwise, you will have some chunk of prune’s peel which is quite annoying.